On this day in 1992, George H.W. Bush publicly vomited on himself and also the prime minister of Japan. That had not taken care of it. There at the table he proceeded to puke. He also swooned into the PM’s lap. Barbara Bush immediately hopped up from her chair, followed by the Secret Service, one of whom climbed over the table in a very smooth move. After a few moments of scrambling, the president got to his feet and did a little victory-victory wobble, to show he was fine. It’s fine! He’s fine! 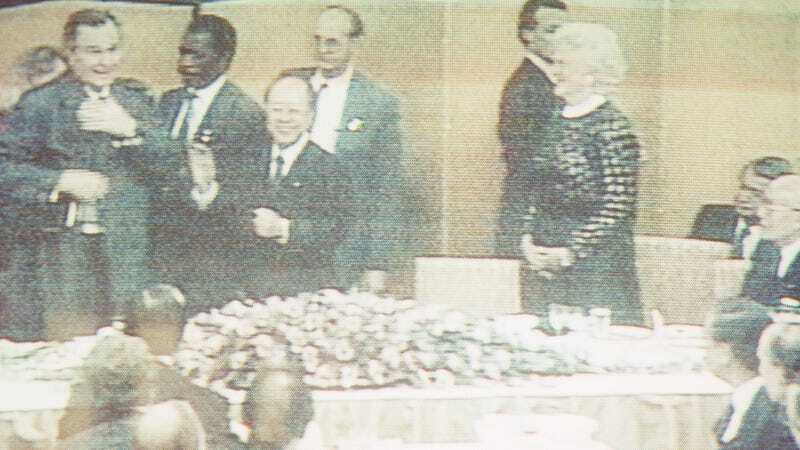 “The President’s host, Prime Minister Kiichi Miyazawa, cradled his head for some minutes until Mr. Bush was strong enough to get up on his own,” the Times added. “I remember breaking out into a cold swear, water just pouring out of me, and then the next thing I knew, literally, I was on the floor,” he wrote in his diary, according to the new Bush biography Destiny and Power. “I woke up, [and] I had this euphoric feeling. It’s hard to describe it... 100 percent strange; and then I looked up, and there I was in the faces of the nurses, and the doctors, and the Secret Service guys, lying flat on the floor.” The Secret Service found him a green raincoat to wear out of the dinner. Because he was covered in vomit. Please take this anniversary as an occasion to forgive yourself for any embarrassing times you barfed, because at least you weren’t the president barfing on the prime minister of Japan.